At 9.15 am on Friday, October 21, 1966 a waste tip slid down a mountainside into the mining village of Aberfan, near Merthyr Tydfil in South Wales. 144 people died in the disaster: 116 of them were school children. Ascending the Heaven Ladder is the first movement of Terry Riley's Requiem for Adam, which was inspired by the tragic death of a young person. In 2005 I wrote an early Overgrown Path post which coupled the Aberfan disaster with Terry Riley's Requiem. Today I offer a link to that post in memory of those who died in Aberfan forty-five years ago. 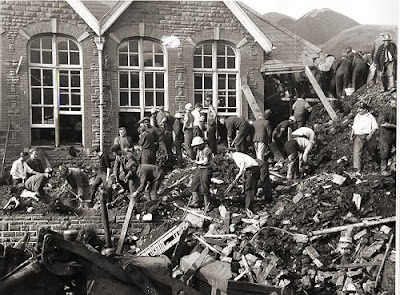 Photo of Aberfan disaster credit Nuffield College, Oxford University. Any copyrighted material on these pages is included as "fair use", for the purpose of study, review or critical analysis only, and will be removed at the request of copyright owner(s). Report broken links, missing images and errors to - overgrownpath at hotmail dot co dot uk Also on Facebook and Twitter.